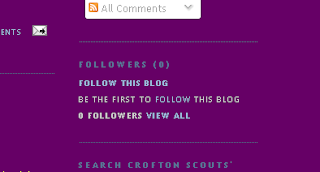 Do you want to keep up with the latest News from Crofton Scouts without having to visit the site every day? Now you can! How? By becoming a "Follower". Click on the "FOLLOW THIS BLOG" link (you'll find it over on the right hand side of this page, about half way down) to find out more.